David is a busy Yorkshire executive in his 40s who has regular working lunches, travels a lot on business and attends conferences and seminars. "I enjoy my work and I admit I’m ambitious", David says. "That means working hard and putting in long hours on professional commitments to clients, as well as promoting new business." "I used to find myself grabbing unhealthy, fast food one week as I travelled around the country or caught flights abroad. The next week I might be over-indulging in rich food and alcohol over several days at a business conference." "I believed I was at the mercy of my busy schedules", says David, "and that my soaring weight and lack of fitness was the price I had to pay for success." Fortunately for David, a routine medical check-up flagged up warning signs that gave him the wake-up call he needed to change his unhealthy lifestyle. "For a start the scales could not hide the fact that I had put on over 20 pounds in one year. My blood-pressure and cholesterol levels were too high and I felt quite stressed. My lifestyle was putting my health at risk and things were destined to get worse unless I made serious changes." "The difficult part was going to be making those changes within the framework of my job commitments. I couldn’t see how it was possible." True, two years later, David’s working week still includes ‘power’ breakfasts, business flights, being on the road a lot and all his other professional commitments. His food diary, however, looks very different. "Once I had taken stock of my unhealthy eating regime and learned how to change it around, I approached it the best way I know how, as if I was making business decisions." "I used to start the day with a muffin of some sort eaten quickly before I drove to the office. That could add up to 400 or 500 calories and then I would go into a working breakfast, even though I didn’t feel hungry." "Now if I have something before I leave home it will be a banana at 100 calories. My working breakfast will be a low-calorie meal of more fruit and a wholemeal roll with a low calorie spread. I am getting a high fibre, low fat start which is already nearly 800 calories less than I used to eat before lunch." "I am very aware now that food that seems to be a healthy low calorie choice might not be. A chicken Caesar salad is actually high in calories, but a large salad with shrimps and a light dressing is just as filling, with 450 fewer calories." 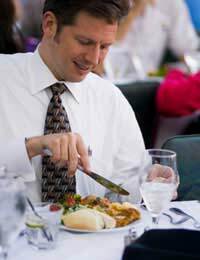 Turning his attention to those business dinners and conference stays, David got valuable advice on how to deal with the component which was escalating the calorie count as much as the food - the alcohol. "I knew this was becoming a problem’, says David. ‘I noticed that if I was drinking throughout a meal I was less in control of choices I was making and was also shocked to find out the hefty toll the drinks put on my calorie count. It was also becoming very habit forming." "The way to stay in charge is to use a trick which I use routinely now. Instead of the usual pre-dinner Scotch on the rocks at 160 calories a glass, I start with a club soda with lime, costing zero calories. It actually quenches that first thirst and also helps reduce the total number of alcoholic drinks I want." "I make a habit of ordering a bottle of mineral water when I sit down, and I alternate sips of water with sips of wine and find that I am enjoying it more." David now enjoys a hearty soup at the start of a meal, knowing that a savoury starter eaten with a dinner roll is a high calorie choice. "I still love pasta but go for the ‘prima vera’ meals of pasta and vegetables, minus the calorie-laden creamy sauces." "My choices are so much lower in calories than before that I often now have a dessert which I would have avoided before. I can have mixed berries and sorbet for only 120 calories." A typical day’s meals for David is now likely to have a healthy calorie count of less than 2000; and his weight loss has had a positive effect in bringing down his blood pressure and cholesterol levels. "I like the fact that I can make business-like choices when I’m eating out" says David. "I am back to a healthy weight and I feel so good, full of energy and free from stress. That’s essential in business if you want to compete at the top."